Transfer from selected hotel in Lima to Lima airport. Overnight in selected hotel in the Sacred Valley. Transfer to Urubamba Station and travel to Machu Picchu. Tour to Machupicchu (all day from 09:30 hr - 20:00 hr). Free afternoon in the city of Cusco. Flight from Cusco to Lima (morning). Peruvian Cooking demonstration classes in the Restaurant "Lordship of Sulco" and lunch buffet. Transfer from airport to hotel in Mancora Piura. Free day in the resort of Mancora. Morning at leisure in the resort of Mancora. Evening transfer to hotel in Mancora Piura airport. Flights from Piura to Lima. Farewell Dinner show at Junius Restaurant. Transfer from hotel to Lima airport for your international flight. Description of the tour: 10 days and 09 nights Lima, Cusco, Machu Picchu and Sacred Valley, Piura, Mancora and Pachacamac. After breakfast at the hotel, transfer to Lima airport, there will be checked and the flight did take the city of Cusco. Upon arrival at the airport, we will be waiting with a sign with your name, we will transfer to hotel, arriving at the hotel can enjoy the famous coca tea, this plant has properties that help your body against altitude sickness, then you can rest and acclimatize a bit at the hotel or if you want to go out and do a gentle walk through the main streets of the city. At approximately 1:20 min meet you at the hotel to begin the tour to the city of Cusco and surroundings, this tour includes visits to: the Plaza de Armas, the Cathedral, the Church of Santo Domingo, Koricancha Temple and the nearby ruins of Kenko, Puka Pukara, Tambomachay and Sacsayhuaman. At 19:00 hrs. We pick you up between 7:45 to 8:00 hrs, the tour began with a stop at the natural viewpoint of Corao where the guide will give an introduction to the Sacred Valley, continue the tour enjoying a beautiful landscape, the first place of visit will be the traditional Indian market of Pisac here you can do some shopping for souvenirs or handicrafts, ascend to Pisaq Archaeological Center where after a short walk to major trade Incas arrived. Continuing the tour will head to the town of Urubamba where at an exclusive restaurant you can taste the local cuisine. In the afternoon we visit the fortress and citadel of Ollantaytambo, built to guard the entrance to this part of the valley and protect it from possible invasion from the tribes of the jungle, Ollantaytambo is currently regarded as the Inca people living in the conservation of the customs and urban style still have their streets. Evening transfer to hotel in Urubamba. 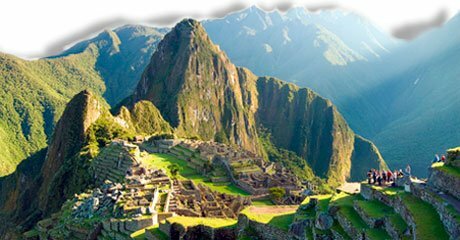 Fourth day: Tour to Machu Picchu "The Lost City of the Incas"
Pick up from your hotel to the train station to start the excursion Urubamba to Machu Picchu the average trip lasts for 2 hours. Arriving at the station in the village of Aguas Calientes our guide will be waiting with it take the bus to take us to rise for 30 min. to the lost city of the Incas. The tour includes a guided tour of the Citadel, visiting the Main Plaza, the Circular Tower, the Sacred Sun Dial, The Royal Quarters, the Temple of the Three Windows and Cemeteries, our tour will last approximately two hours more. Then we have time to go to Aguas Calientes and lunch, in the afternoon we take the train back to Cusco. Arriving where our staff is waiting to take you to the hotel for overnight. Fifth day: South Valley Tour "Tipon, Andahuaylillas and Pikillaqta"
We will pick you up from your hotel at 8:20 hrs for a guided tour in the south valley known for this tour that combines three architectural styles: Inca Tipon, pre - Inca Wari Pikillacta Andahuaylillas colonial with its beautiful chapel , also known as the "Sistine Chapel of America". Tipon: A large growing space that contains 12 impressive terraces that are now grown, whose walls were built with finely carved Pikillaqta: Presents characteristics of a large urban center for the development time of the Wari empire with over a thousand buildings between places, colcas (food stores), fields or homes, temples, long and narrow streets with buildings that were up to 4 stories high. Andahuaylillas: Typical Andean village time the colony of origin and unique architecture. Stresses in Andahuaylillas the Catholic church in the colonial era with beautiful decoration and wall paintings seventeenth and eighteenth century known as the Sistine Chapel of America. On the return pass by Saylla, Cuzco typical village where you can enjoy delicious pork rinds (optional). We will be returning to the city of Cusco at approximately 14:30 pm. In the evening dinner show in one of the most typical restaurants of Cusco and overnight at the hotel. After taking breakfast at the hotel, you have free time to be able to shop, then transferred to Cusco airport to board the flight back to Lima (The flight lasts 80 minutes). At the airport in Lima, we will be waiting with a sign with your name, then transfer to a designated time at the Manor Restaurant Sulco in this prestigious restaurant will receive a master class in Peruvian cuisine, the chef will prepare three dishes representing the Peruvian cuisine (chicken causa, ceviche and lomo saltado), in which a brief explanation of the inputs used, cooking techniques for preparing and decorating the plate. Then enjoy a buffet lunch. In the afternoon you will be transferred to the airport for the trip to the city of Piura where again the staff will meet and transfer to hotel in Mancora where you stay overnight. The white sand, the color of its waters and the tranquility of the landscape, make us the ideal place for rest and relaxation. We invite you to enjoy gourmet food high in front of the sea. You must try the lobster and tuna only Peruvian. We also offer typical Peruvian and International Charter. In the bar, do not miss a refreshing Mojito, a Bloody Mary, or Algarrobina Cocktail: carob tree originally grown in northern Peru. In a place like this, you can have a memorable vacation, relaxing around the pool or on the beach, and when night comes, enjoy around the campfire and have a nice and delicious dinner in our restaurant with a variety of dishes. Overnight at hotel in Mancora. In the morning after breakfast, you can still enjoy the white sands and crystal clear waters of Mancora is always a solution to your needs in order to make your stay more enjoyable. The following activities are available, made by local companies Table trusted classes Recommended Classes, Kite Surfing, Luxury Sailing Classes, Diving, Tour to the Pools of water Mud Springs, Horseback Riding on the beach in the afternoon transfer to the airport for your flight Piura return to the city of Lima, where our staff will wait for transfer to your hotel. Ninth day: "Tour to Pachacamac and Farewell Lunch"
Will pick you up at 09:00 am from your hotel to make the tour to the Sanctuary and Oracle of Pachacamac God or "God the Creator of the World". Located 31 km south of Lima. Sacred place of pilgrimage and ancestral worship, which highlights the history museum, The Pyramid Set, Temples and Palaces of Pre-Inca and Inca. The enigmatic Temples of the Sun and Moon, a place that would shelter the Virgins of the Sun All this is accompanied by an overview of the various faces of the city and the expansion of it, through space and time as seen in the tour of the beaches of Costa Verde and the Salto del Fraile, the nature of the Villa Marshlands (variety of birds especially in the summer) and picturesque surrounding neighborhoods. In the evening we will transfer you to a tourist restaurant in Lima to offer our varied Peruvian cuisine and live show, which today has been further recognized and evening rest in the hotel. Tenth day: "Transfer to airport and farewell"
After having breakfast and the time to tell us, we will transfer from hotel to airport Jorge Chavez in Callao. We must be two hours before the time of your international flight, you must take into account the payment of airport tax of U.S. $ 36.00, after checked, we say goodbye and you take flight to your country. All airport transfers, hotels, terminals and stations. 03 nights in hotel in Lima. 3 Nights at selected hotel in Cusco. Tour in Lima City of Kings. 1 Lunch at Machu Picchu 1 lunch in the Sacred Valley. 1 dinner in Lima and 1 dinner in Cusco. All entries, guides and transportation for revenue.